You will have the chance to experience our products. The sending will be free of charge and without purchase obligation. A touch of freshness in your promotion! Stilolinea is an Italian company founded in 1972. 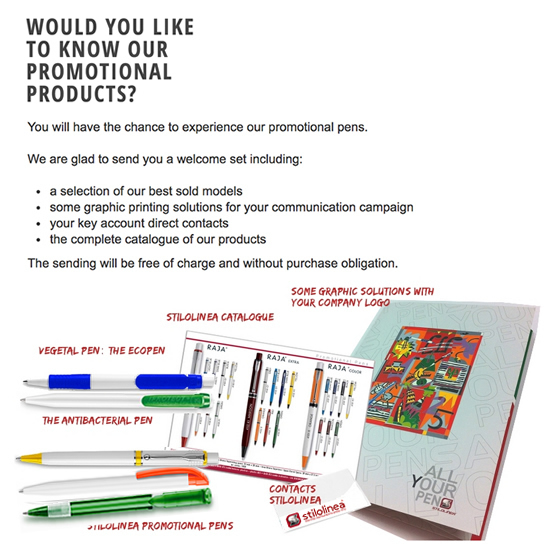 It is a leading manufacturer of high quality, long-lasting promotional pens and writing instruments which bear the unmistakeable stamp of Italian design. We design and create our promotional pens with the greatest attention to detail which has set us apart from the very beginning: high quality finishes thanks to our manufacturing moulds, large areas for personalisation, a wide range of colours, including custom-made, long-lasting refills and continued and constant availability of the products, giving our customers a fast and reliable service. Constant research and innovation: thanks to this the Stilolinea pens are cutting edge, made from non-toxic, durable materials. They are checked at every manufacturing phase and are environmentally friendly.